First on was the Dark Gray layer. I laid it on pretty thick given that it was just up from the black base coat. One thing I was worried about was whether my black ballast-and-glue mix would be robust enough to stand up to the sort of painting I would need to do. I didn’t want chunks of that base layer to come off and reveal the foam underneath. Luckily, this worry was unfounded. The Dark Gray went on smooth. I let the paint dry for about 24 hours. I then started the next layer of Light Gray, taking more of a dry-brush approach. I let that sit for a couple hours before doing a very light highlight dry-brush of white. The following day, I finished it off with a few patches of static grass. 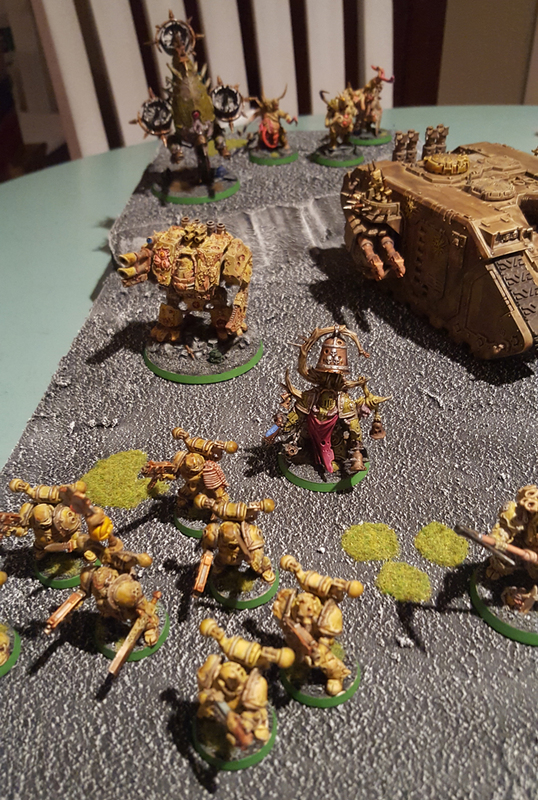 The last thing I did was test the board to see what from my army could fit. Wouldn’t you know, it was a lot more spacious than I first thought. 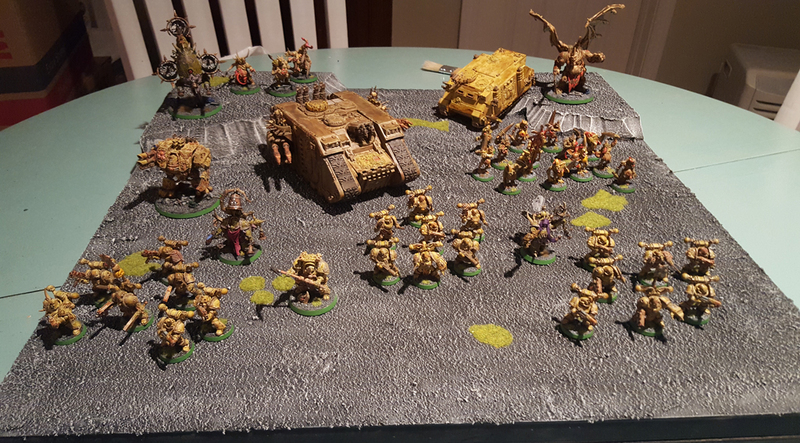 I was able to fit on pretty much all my Death Guard army. I put the Landraider pretty close to the center, then tried placing different units in different places. I knew I wanted the Daemon Prince and the Bloat Drone on the little mesas. 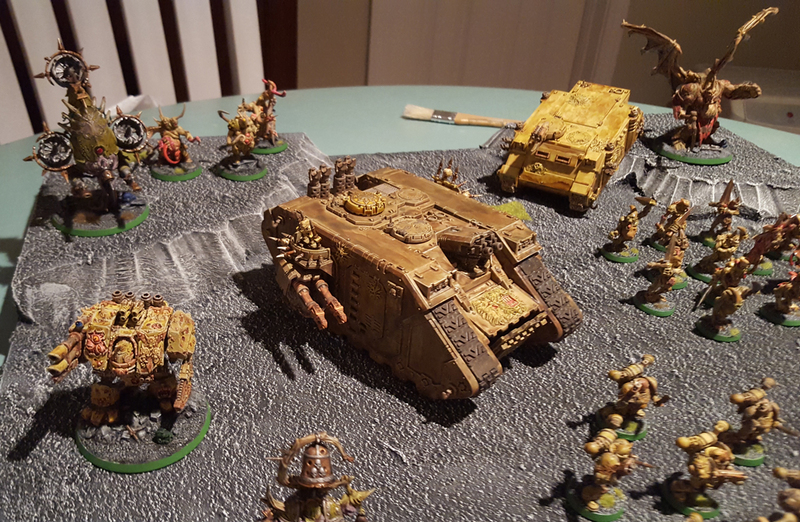 I settled on having the Rhino come down one of the mesas and put the Chaos Spawn unit on the other. I had three units of plague marines I placed toward the front. I added a unit of Plague Bearers just to give the army a more foot soldiers. I then settled on placement of the Helbrute. The last thing I did was squeeze in the character models where I could. It took a little while to figure out the “balance” of the board. I was pleased with how everything came out. I was impressed with how well the old Apple Barrel paints matched up with the Citadel colors I’d used on the Death Guard bases. 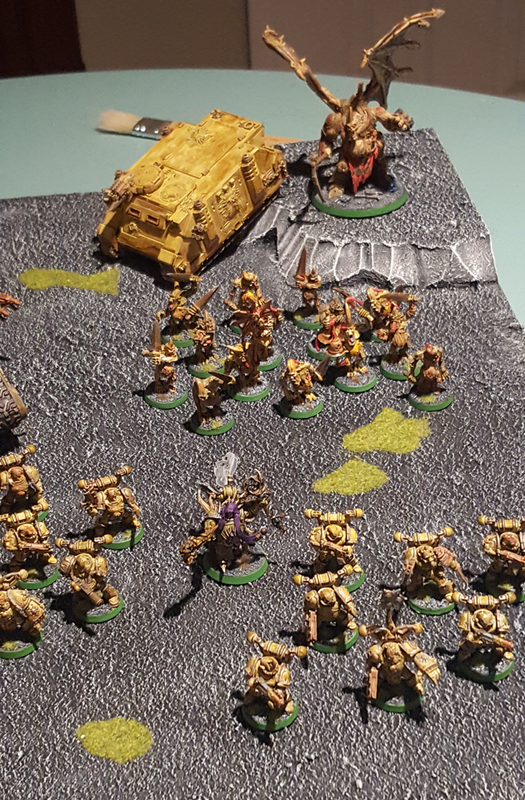 I was also glad to see that my Death Guard army wasn’t quite big enough to cover the entire board. There’s plenty of room for additions. That’s it for now. I’ll be back on in a few days (I promise) to do an update on the models I’m building. As always, thanks for reading!